Titus Flavius Caesar Domitianus Augustus the future emperor of Rome was born. He became emperor after his brother Titus’ death in AD 81. Domitian was the second son of Vespasian, who had won the principate at the end of the year of four emperors succeeded his brother Titus to the imperial purple. However, as so often seems to be the case with Roman dynasties the Flavians ended on a poor note with Domitian generally thought to have been a horrendous and brutal emperor. It should be remembered that some of the negativity surrounding Domitian’s reign could be the result of an anti-Domitianic tradition designed to flatter his successors, particularly Trajan, leading to many of his acts being described in the most derogatory fashion possible. Then pretending to betray a conspiracy and for that reason being given an audience, [Stephanus] stabbed the emperor in the groin as he was reading a paper which the assassin handed him, and stood in a state of amazement. As the wounded emperor attempted to resist, he was slain with seven wounds by Clodianus, a subaltern, Maximus, a freedman of Parthenius, Satur, decurion of the chamberlains, and a gladiator from the imperial school. Domitian although considered one of the worst Roman emperors probably suffers from a lot of bad press. He was the last of the Flavian emperors as such criticisms of him were not criticisms of his successors Nerva and more importantly Trajan. Therefore the sources, particularly Tacitus who has an axe to grind with Doomitian, are able to denigrate him in order to demonstrate how great his successor are using Domitian as a counterpoint. That said the Senate clearly thought little of him and on his death instituted damnatio memoriae which essentially meant the removal of his name from the record. As is illustrated on the bell below Domitian’s name was excised wherever possible.That said the military very much liked Domitian. 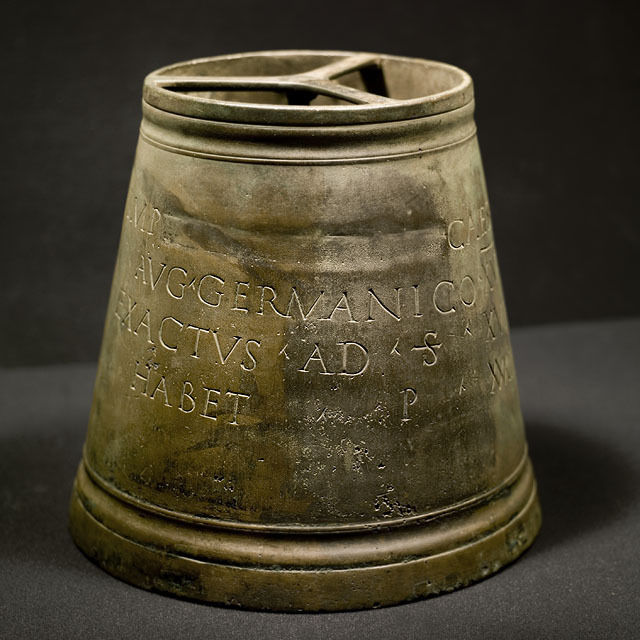 note the top line of the inscription on the bell where Domitian’s name has been removed.